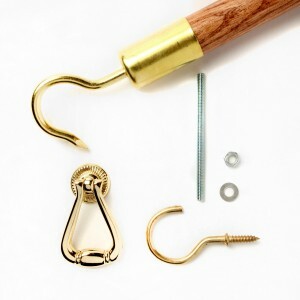 The Attic Ease kit comes in a pewter or brass finish. Jones designed a prototype in his garage and went about having it manufactured and marketed, before delivering the first kits to Elliott’s Hardware in Plano in 2012. “Elliott’s enthusiastically supported the product and has been an important outlet for us ever since,” said Jones, noting the strong local support for his invention. Business growth this year has been dramatic, largely through Internet sales, Jones said. Home Depot, Lowes, and Menards (the three largest U.S. home improvement centers) all sell Attic Ease online. Wayfair.com came onboard earlier this year, and Amazon.com offers Attic Ease kits through nine separate re-sellers. As of September, Walmart.com is selling Attic Ease kits (and they have 45 million monthly visitors). Home Depot has been selling the kits online for more than one year, and their success has caused them to order the kits for their 60 greater Dallas-Fort Worth stores to conduct in-store tests of the products to determine if a chain-wide roll-out will succeed. Attic Ease kits are available at retail outlets in Texas, Louisiana, Mississippi, New Mexico and Illinois. Locally, Attic Ease is sold at Pierce Decorative Hardware and Plumbing (and, of course, Elliott’s in Plano and their Dallas store on Denton Tap). Attic Ease gained distribution early through a national hardware co-op, Do It Best, in Fort Wayne, Indiana, which supplies more than 5,000 stores worldwide. Do It Best has stocked kits in all eight of their distribution centers throughout the U.S. (including one in Waco) since early 2013, and have customers who sell Attic Ease worldwide. All of this is huge news for Jones, who said this period of time is a critical juncture for Attic Ease. Lakewood Home Festival Auction Party Features Adorable Playhouse You Can Win! I can’t believe this is a real product. Good for him for actually bringing it to market, but he sure didn’t “invent” the concept. I made mine 10 years ago, and I’m sure other handymen have decades on me.